For more than 125 years, GE has been a company that makes things. Big things. Little things. In-between things. Inventing and perfecting these innovations has been a constant theme for GE dating all the way back to the days of Thomas Edison. We’re largely seen as an original equipment manufacturer (OEM). Every 2 seconds a GE-powered aircraft takes off, and GE powers over 30% of the world’s energy. What many don’t realize is that a significant portion of GE revenue comes from its service business, largely through monitoring and maintaining the equipment we sell. This is the real profit engine driving the company forward. But it’s not just GE–and it’s not “new.” As a whole, service offerings for OEMs have been growing at twice the rate of equipment sales for the last decade, and profit margins are even higher. This growth and profitability are a big reason why across the entire industry after-sales service is evolving from a cost center, to a differentiator, and even to a “product” in its own right. At GE, we know how to build machines; jet engines, wind turbines, MRI scanners: we know what makes them tick, what makes them break, when they should be serviced, and when they should be left alone. And by gathering and analyzing performance data from our equipment in different operating environments, we’re able to minimize preventative maintenance in favor of condition-based and predictive maintenance–saving both GE and our customers money, and delivering better reliability and higher customer satisfaction at the same time. Of course, happier customers are more likely to renew service contracts and more likely to be loyal to our brand–a true virtuous cycle. I’ve met with a wide range of OEMs—all at different stages of their technological journey to build modern after-sales businesses. Everything from companies purely focused on break-fix maintenance, to organizations much like GE using remote monitoring and condition-based maintenance on their customers’ equipment to drive service revenues up and costs down, or to generate valuable insights that fuel product innovations and market differentiation. There was a time when only the most sophisticated and expensive of equipment warranted this type of treatment–not any more. 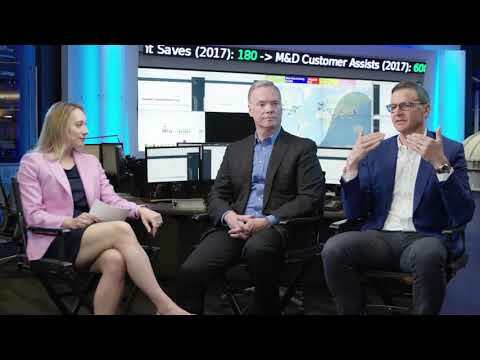 As technology costs have dropped, and reached the point where virtually any OEM can make the business case for smart connected equipment, I’m seeing more and more customers ask for GE’s help in undergoing services transformation. Whether you manufacture elevators, assembly line robots, or construction cranes, you possess insights into your equipment that no other firm can easily replicate. No one is in a better position to leverage these insights to drive superior service and maintenance for your customers than you–or to drive new product innovations with the insights you gleam. This is your competitive advantage — and now’s the time to monetize it. Yes, we can help. For OEMs looking to build their services business, our comprehensive software portfolio can help accelerate your transformation. Predix Asset Performance Management and ServiceMax come with everything needed to gain a real-time view into asset health, optimize maintenance, empower field service workers, and capture valuable insights that can push your services business forward, opening up brand new revenue streams. But the value of these solutions isn’t limited to service offerings. In tracking customer equipment data, you’ll gain a better understanding of how your equipment is used in the real world, enabling you to innovate faster and produce better products. It’s an exciting time to be an OEM, and we at GE look forward to working together to innovate new business models that more accurately reflect our ever-evolving, interconnected world and the technologies that make it a little smaller every day. Interested in learning more? Watch our on-demand webcast, where we share some of our learnings in building our own services business, and talk about the technologies and systems we and other OEMs are leveraging to thrive in today’s digital world. David leads Product Marketing for our Asset Performance Management suite (APM) for Equipment Manufacturers (OEMs), Food and Beverage &amp; Consumer Packaged Goods (CPG). His experience spans brand management, marketing, and product management for consumer, SMB, and enterprise software. Watch this recap video. Then, tune into the full on demand webcast to explore new digital environments and learn about what it takes—technologically and culturally—to thrive in today’s industrial world. Increase after-sales revenue, reduce service and warranty costs, and innovate faster.